Tekashi 6ix9ine (real name Daniel Hernandez) has been behind bars at a federal prison for over a month now after he was arrested and indicted on racketeering and firearm charges. He's also being accused of being involved in violent street gang activities. He faces up to 32 years in prison if he's found guilty on the charges. 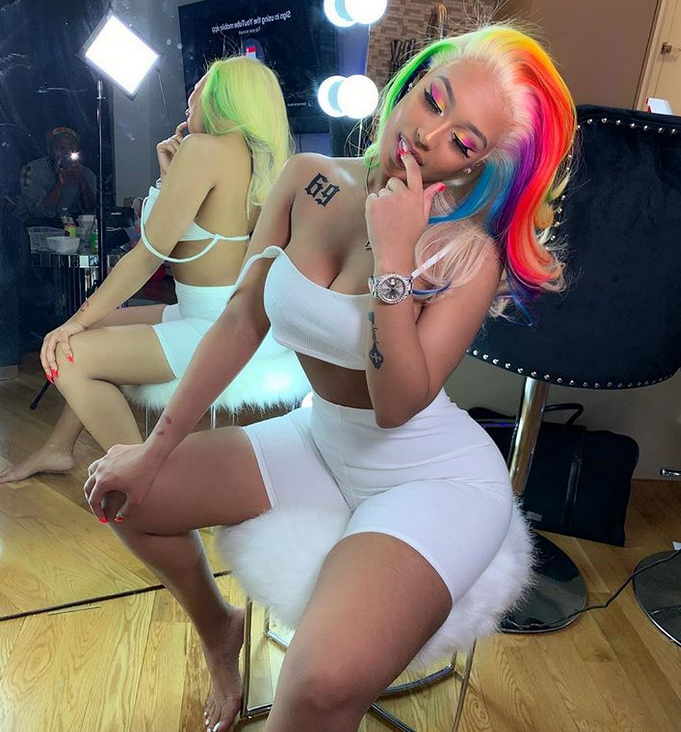 The "FEFE" rapper has been working hard behind bars, trying to get the judge presiding over his case to release him on bail. You'll recall, the 22-year-old rapper was denied bail for being "too dangerous." One way he's trying to catch Judge Paul A Engelmayer's attention is via a Change.org petition. Tekashi's girlfriend Jade is playing her "ride or die" role, posting the petition to her Instagram yesterday while encouraging his fans to sign it in an effort to get him bail. 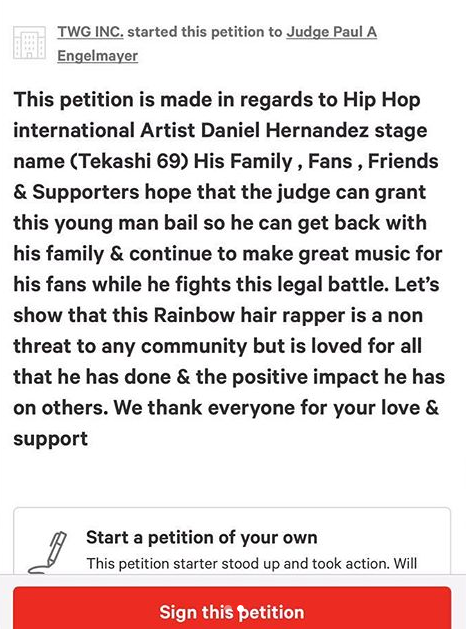 "This petition is made in regards to Hip Hop international Artist Daniel Hernandez stage name (Tekashi 69) His Family , Fans , Friends & Supporters hope that the judge can grant this young man bail so he can get back with his family & continue to make great music for his fans while he fights this legal battle. Let’s show that this Rainbow hair rapper is a non threat to any community but is loved for all that he has done & the positive impact he has on others. We thank everyone for your love & support"
As of the time of this post, more than 39,700 people have signed the petition. The goal is to get 50,000 signatures. We doubt a petition of signatures will sway the judge's decision, but OK. Even after he was already denied bail, Tekashi's lawyer, Lance Lazarro, has been putting together a bail package in hopes of getting him out of federal prison. 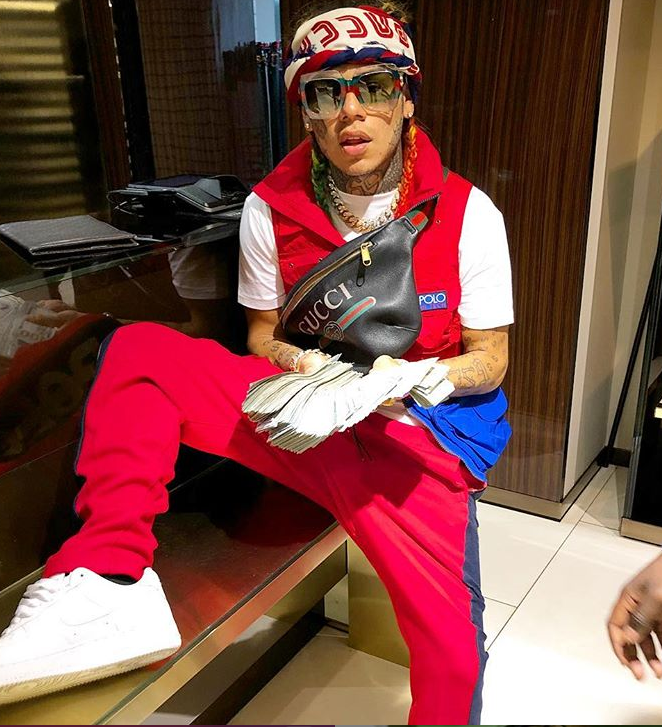 It has been reported that Tekashi was only using his "gangster" image for entertainment purposes, however, authorities feel they have enough evidence to prove he WAS involved with the gang related activities. 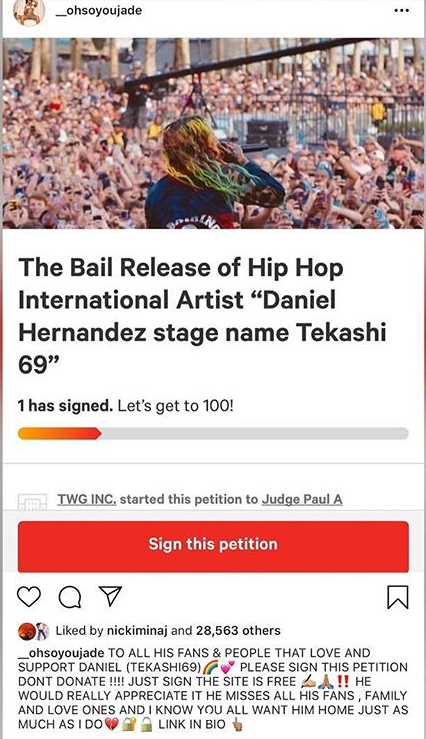 We're told the plan is to ask the court to set 69's bail at $1.5 million, and Lazarro will also make the case that Tekashi's not a danger to the community ... nor is he a flight risk. As we reported ... prosecutors have pics and videos linking Tekashi and his crew to at least 3 armed robberies and/or shootings in Brooklyn earlier this year. And, despite the mounting evidence in his racketeering case, Lazarro's made it clear 69 has no interest in taking a plea deal if one is offered. Hmm...he has $1.5 million to post bail even though his daughter's mother, Sara, claims he doesn't help take care of their child? Oh. She made claims recently that she nor her daughter have spoke to him since he has been locked up. Oh, he also gifted Jade with a G-Wagon for Christmas. Catch that tea HERE. Tekashi's trial is set for September 2019. Rae Sremmurd rapper Swae Lee must be petitioning to sing the "Star-Spangled Banner" at a sporting event or something. While in Atlanta recently, the rapper shared a sneak peek at his autotuned rendition of the National Anthem. It's interesting, to say the least. We wonder if any promoters will be hitting his line soon to book him for a National Anthem performance. In meantime, see what vocals Swae Lee has (with the help of autotune) above. PREVIOUS: OH? Bow Wow Got That Old Thing Back With Kiyomi? NEXT: Cassie Shares Kissy Photo With New Bull Riding Buff Body BAE After Ex-Diddy Professes His Love For Her - MEET THE MYSTERY GUY!